In our recent plenary meeting in Athens, we had the opportynity to invite Nikos (one of our research participants) to become the beta tester of our hands-free Tetris. Until now, the version of Tetris operated through Eyes and Mind has only been tested in laboratory settings with able-bodied users. It was the first time that we had the opportinity to have the game played in a realistic environment by an individual with neuro-muscular disorders. 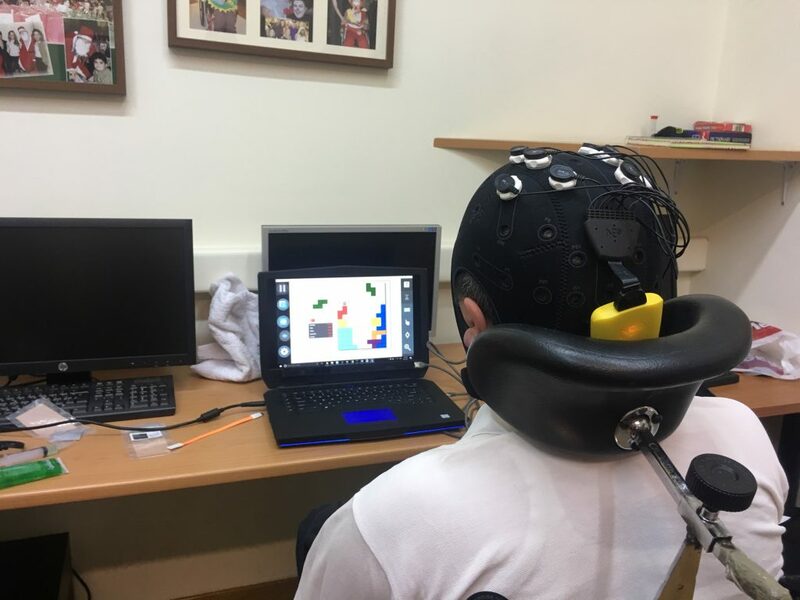 Nikos went through a short process of training so as to learn how to rotate the tiles with his thought (SMR Training), as well as how to shift the tiles with his gaze (Eye-tracking calibration). Subsequently, a few details were explained to him on how to interpret the SMR feedback and how to treat the different modalities, before setting him free to enjoy the game. Nikos was rather exhited to play the game, staying for more than an hour in front of the screen having in total, five complete Tetris games. Even though a novice player in this type of Tetris, he was also rather effective in playing the game with the clearance of five rows being his maximum score. We are very exhited to further improve the hands-free version of Tetris for offering an engaging and joyfull experience to our end users!